Chesapeake Energy’s stock is down 21% off its high. Here are three things that could cause it to regain those highs again. Chesapeake Energy's (NYSE:CHK) stock is down more than 21% off its most recent high, weighed down by an almost 30% plunge in the price of oil, as shown in the following chart. If there is a silver lining here it's that Chesapeake Energy's stock has started to recover even as oil prices continue to slide. This is a trend that could continue. In fact, I see three reasons why the company's stock could rise again to previous highs even if oil prices don't budge. One reason for the recovery in Chesapeake Energy's stock value is because natural gas prices are heating up as winter begins to set in on North America. The following chart shows that the price of natural gas recently bounced off of its low, taking Chesapeake Energy's stock along with it. This shouldn't come as a surprise, as Chesapeake is a top natural gas producer even as it focuses on growing its oil production. Currently, 71% of the company's production is natural gas, and it remains America's second-largest natural gas producer. 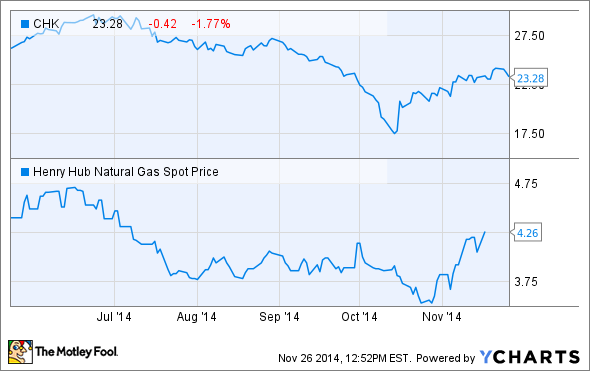 Any sustained increase in natural gas prices makes the company's production and assets all that more valuable. So, natural gas is more likely than oil to push Chesapeake Energy's stock past its recent high. Another big driver for the company is its ability to improve the rate of return it earns on each new well it drills. The company is seeing compelling returns from these additional investments by drilling cross-unit laterals in each well. This type of approach helps the company to increase lateral lengths and access resources that might have otherwise been left undeveloped. As the following slide illustrates, the company has shaved $1.5 million off its well costs in the Haynesville shale over the past year, but has reinvested $500,000 per well into cross-unit laterals. Source: Chesapeake Energy Investor Presentation. The company is seeing a 34% improvement on its rate of return just from this additional investment alone, which is yielding a gain of $2 million in net present value per well. The company is testing new drilling concepts across its portfolio in search of incremental returns such as what it is seeing in the Haynesville. If the company can continue to boost the returns of its wells, it won't necessarily need higher oil or gas prices to push its stock price up; instead, Chesapeake's assets will become more valuable because of the value it creates from using these new techniques. The other big driver is that Chesapeake Energy is in its best financial shape ever, according to its CFO. The company's focus on paying down debt and reducing balance sheet complexity has resulted in net debt dropping 10% and total adjusted leverage plunging 30% in just the last two years. That's before accounting for the company's recently announced $5.4 billion sale of its southern Marcellus and Utica shale assets to Southwestern Energy. Once that deal closes, Chesapeake Energy will have a lot of flexibility to ramp up drilling on its own acreage or even acquire a weaker rival with compelling acreage. If the company goes the acquisition route, it could add an oil-rich growth asset to complement its positions in the Eagle Ford shale and Powder River Basin by possibly adding a third oil-growth location such as the Permian Basin or the Bakken shale. The opportunity to make a needle-moving oil deal hasn't been possible until now because the company simply hasn't had the balance sheet flexibility to go on the offensive. 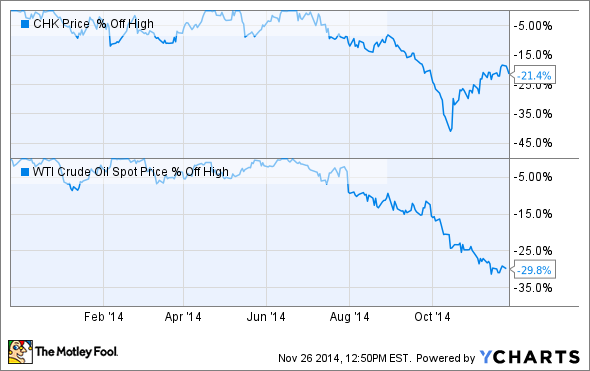 Falling oil prices have certainly pulled down Chesapeake Energy's stock price. But, that doesn't mean its future success requires higher prices. That's because it has a lot more leverage with natural gas to go along with a drilling program that is earning better returns on every dollar spent. Add to that the fact that the company's financial picture could allow it to go on the offensive and we have a stock that could head higher even if oil prices don't.